As the weather gets colder and the days get darker, you’re probably seeking out soft, fuzzy materials to snuggle up with in your New York apartment. 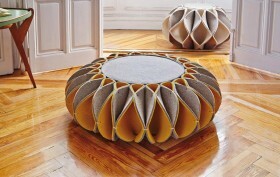 One new item we would definitely like to get cozy with is Romero Vallejo‘s Ruff Pouf. This contemporary ottoman is crowned with an ingenious folded felt structure inspired by neck ruffles worn by men and women during the Elizabethan era.